It’s enough of a feat to win one WSOP bracelet in a year, but there is an elite group of poker players who are talented (and lucky) enough to have taken home multiple bracelets in a single WSOP. Even more rarefied are those souls who have accomplished this feat more than once. Every WSOP since 2000 has produced a multiple bracelet winner—who will it be this year? In the meantime, check out our picks for the Top 10 multiple bracelet winners from a single WSOP. 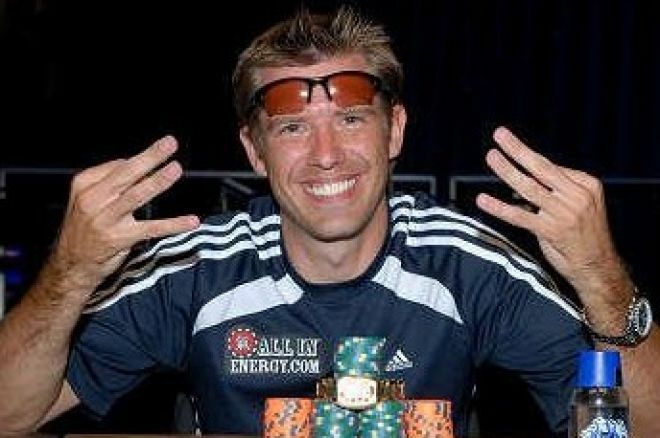 Copenhagen native Jesper Hougaard earned both of his WSOP bracelets in 2008. Buoyed by a raucous crew of crown-wearing, axe-weilding (and Milwaukee’s Best-drinking) Danish railbirds, Hougaard beat out a field of 2,447 players to win his first bracelet and $610,304 in the $1,500 No-Limit Hold’em event. Only a few months later at the second annual WSOP-Europe, he captured his second, topping a final table that included Yevgeniy Timoshenko, Neil Channing, and Adam Junglen in the £1,500 No-Limit Hold’em event. With that win, Hougaard became the first and thus far only player to win a bracelet in Las Vegas and a bracelet in London in the same year. Also an accomplished online player, he has twice won the PokerStars Sunday Million. Newly relocated to the Rio from Binion’s Horseshoe, the 2005 WSOP was the first “super-sized” World Series. That year, Mark Seif became the first to win two bracelets in one summer inside the Amazon Room, beating out a then-record 2,013 players to win the $1,500 No-Limit Hold’em event and only weeks later taking down his second bracelet in the $1,500 Limit Hold’em Shootout. A longtime Southern California tournament fixture and a former attorney, Seif most recently made the final table of the 2008 WPT Borgata Poker Open, where he finished fifth, and cashed the 2009 WPT Championships this past April in 38th place. Newly 21 and a World Series rookie when he stepped into the Amazon Room in 2006, Jeff Madsen left Las Vegas that summer with two gold bracelets on his wrist. His first came in the $2,000 No-Limit Hold’em event where he had to weed through a field of 1,579 players and he earned his second less than a week later after beating Erick Lindgren heads-up for the title in the $5,000 Short-Handed No-Limit Hold’em event. At the time, Madsen was the youngest player ever to win a WSOP bracelet (Steve Billirakis broke the record a year later). Along with his third-place finish in the $2,000 Omaha Hi-Lo event, Madsen’s double-bracelet performance earned him Player of the Year honors at the 2006 WSOP. Here’s something you may not know, poker fans. Six days before he won the 1995 Main Event, Dan Harrington won his first WSOP bracelet in the $2,500 No-Limit Hold’em event, besting a final table that included Chip Reese, John Gordon and Chuck Thompson to win nearly a quarter of a million dollars. The following week he earned a cool million for taking down the Main Event, the final table featuring Barbara Enright, Hamid Dasmatchi, Brent Carter, and “Captain” Tom Franklin. In the post-boom years, Harrington went on to turn out arguably the greatest back-to-back Main Event performance of all time, finishing third of 839 entries in the 2003 Main Event and fourth of 2,576 entries in 2004. Harrington’s WSOP success in no small part led to the publication of his revered multi-volume tome Harrington on Hold’em. He also earned a WPT title in 2007 when he won the Legends of Poker for over $1.6 million. Love him or hate him, Men “The Master” Nguyen is a member of the uber-elite club of poker players who have won multiple bracelets in the same WSOP more than one time. In 1995, Nguyen won the $2,500 Seven-Card Stud Hi-Lo event and the $2,500 Limit Hold’em event, earning his second and third WSOP bracelets. In 2003 he took home another two, taking down the $5,000 Seven-Card Stud event and the $1,500 Ace-to-Five Triple Draw Lowball event for bracelets number five and six. Nguyen also sits at #2 on the list of most lifetime cashes at the WSOP with 62 and most recently, he finished third at the WSOP-Circuit event at Caesar’s Palace. A feat even rarer than winning two bracelets in one year, Phil Ivey won three in the space of 18 days at the 2002 WSOP. He’d already picked up his first bracelet back in 2000 in the $2,500 Pot-Limit Omaha event when he made his spectacular run in ’02, winning the $1,500 Seven-Card Stud event, the $2,500 Seven-Card Stud Hi-Lo event, and the $2,000 S.H.O.E. event. Now a five-time bracelet winner with his $5,000 Pot-Limit Omaha victory in 2005, Ivey is rumored to have upwards of $10 million riding on bets that he’ll win his sixth bracelet this summer. Like Ivey, Phil Hellmuth has won three bracelets in one year, winning the $1,500 No-Limit Hold’em event, the $2,500 No-Limit Hold’em event, and the $5,000 Limit Hold’em event in 1993 (and he did it in 13 days). Hellmuth made a multiple-bracelet run again at the dawn of the poker boom, winning the $2,500 Limit Hold’em event and the $3,000 No-Limit Hold’em event at the 2003 WSOP. Those two years account for five of his record eleven bracelets, number eleven coming at the 2007 WSOP where he beat out a massive field of 2,628 players to win the $1,500 No-Limit Hold’em event. Hellmuth came close to #12 in 2008, finishing third in the $1,500 H.O.R.S.E. event, which would have been his only non-hold’em victory at the WSOP. Two weeks before he won the 2000 WSOP Main Event, Chris “Jesus” Ferguson picked up his first bracelet when he took down the $2,500 Seven-Card Stud event. Ferguson picked up this third bracelet in 2001, then scored multiple victories again in 2003, when he won the $2,000 Omaha Hi-Lo event and the $2,000 Half Hold’em, Half Seven-Card Stud event, bringing his total to five. Ferguson got achingly close to #6 last summer when he finished second to Sebastian Ruthenberg in the $5,000 World Championship Seven-Card Stud Hi-Lo event after a lengthy heads-up battle. Most recently, Ferguson made the final table of the WPT L.A. Poker Classic where he finished sixth and made a runner-up finish to Alexander Kostritsyn in the $10,000 H.O.R.S.E. event at the 2009 Aussie Millions. Ted Forrest won all five of his WSOP bracelets in two separate years. At the 1993 WSOP, “Professor Backwards” pulled a three-peat, winning the $1,500 Razz, $1,500 Omaha 8 or Better, and $5,000 Seven-Card Stud events. Eleven years later at the 2004 WSOP, he pulled it off again, winning another two bracelets in the $1,500 Seven-Card Stud event and the $1,500 No-Limit Hold’em event. The $1,500 stud event was one of the first preliminary events televised by ESPN and Forrest earned some permanent TV face time by making that final table—it still airs in repeats to this day. Layne Flack earned the nickname “Back-to-Back Flack” in 2002 when he won two WSOP bracelets in the $2,000 No-Limit Hold’em event and the $1,500 No-Limit Hold’em event. He couldn’t have possibly known it then, but he’d go back-to-back again the following year, winning the $2,500 Omaha Hi-Lo event and the $1,500 Limit Hold’em Shootout for bracelets #4 and #5. After a lengthy drought between major scores, Flack made a huge comeback, earning his sixth bracelet at the 2008 WSOP when he took down the $1,500 Pot-Limit Omaha event.